I saw my future today. The younger generation is being warned that I may be taking a stroll on the same sidewalk where they walk and talk mindlessly on cell phones. I didn’t know whether to laugh or cry when I saw this sign on the boardwalk next to the boating docks behind my Miami condo. There is an apartment building a few doors down that is dedicated to senior living. Seriously, this sign is a courtesy for them, but in a blink of an eye it will be for me. 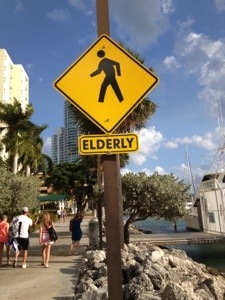 This entry was posted in digital, senior lifestyle, tech and tagged Elderly, signs by loiswhitman. Bookmark the permalink. Sorry to tell you, but it was you about 5 years ago. That you are only noticing now is a sign of your delayed reaction time. Ouch! That was pretty harsh! You have seen the future and it is there for all of us. Very depressing!